Just one amongst the many beautiful endemics of the U.S. 50th State, Hawai'i's Potter's Angel is not easy for many to locate in the wild... w/o careful observation. It's relatively abundant in and amongst the finger-like coral (Porites compressa) which is its typical domain, but so secretive that w/o keen searching and patience, most divers miss it entirely. This cryptic lifestyle is a chief clue to success with Potter's in captivity. They're shy, need plenty of cover, and a dearth of "busy" tankmates. Most failures in the care of this Centropyge stem from a lack of this understanding... coupled with the trials of rough capture, tortuous holding, shipping and handling stress and damage through the "chain of custody" going from the wild through wholesalers, retailers to the consumer. Centropyge potteri is only found in two island areas in the Eastern Central Pacific; Johnston and Hawai'i. Most adults are found in more than fifty feet of water, though juveniles occur beyond as little as twenty feet. Potter's can usually be found darting in and amongst broken rocky bottom and good live-coral covered seaward reefs at these depths. Maximum size for the species is about four inches, with most individuals offered in the trade between three and four inches. Centropyge potteri Jordan & Metz 1912, Potter's Dwarf Angel, named after Frederick Potter, the first director of the Waikiki Aquarium. One at the Waikiki Aquarium in O'ahu. A viejo (old one) below in Kona. When picking one of these out for use, make sure to acquire a well-adjusted individual; I'd wait till it was in captivity a good two weeks. And only try this species in a very well-established reef tank, with peaceful tankmates, AFTER you've become an "advanced" aquarist. The need for careful selection cannot be over-stated. As mentioned here, likely the majority of Potter's collected are doomed despite anything you might be able to provide or do... from what Morgan Lidster of Inland Aquatics labels as "Post Trauma Collecting Disorder... " the sum total of stress and damage from and through the process of gathering, holding and shipping wild livestock. Potter's is an able "poster child" here. To keep a healthy Potter's you must provide: Space, an established system, habitat, and few competitors. Swimming room should include a good four to six feet of frontage, with reasonable width to allow for hard substrate stacking. To provide forage, the tank should have been set-up at least a few months. Rock, coral skeletons and live stony coral will provide for hiding spaces. Lastly, this fish does not tolerate other dwarf angels or members of its own kind (except for mated pairs), nor will it come out much if there is a lot of commotion in its space. The best fishes to house with it are ones that are naturally found in the same habitat... a good-long list. There are standard works on the fishes of Hawai'i (see bibliography) as well as the fantastic resource which is Fishbase.org... where one may (among other things) download/view all the fishes recorded from a given area/nation. 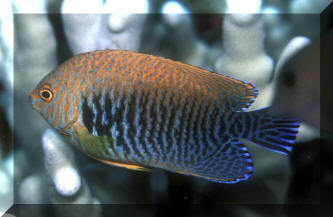 Centropyge potteri is found in and amongst Porites compressa and rocky reef habitat in moderate depths in its range. Rock arranged to permit its passing in and back out with some stony coral cover in captive settings approximates this biotope. Circulation in most places where Potter's are found is medium to high, depending on prevailing tide and wave conditions. There is never a dearth of dissolved oxygen, nor evidence of accumulated nitrogenous wastes. Lighting need not be overly bright. Just sufficient to supply the stony corals et al. photosynthetic life you wish to use here. Fishes found with Potter's mainly include wandering Surgeonfishes (Yellow Tangs, Zebrasoma flavescens), Koles or Yellow Eyes (Ctenochaetus strigosus), and Lavendars (Acanthurus nigrofuscus), small wrasses; mostly the aptly-named Disappearing (Pseudochelinus evanidus) and the Striped species in the same genus (the Sixline: Pseudocheilinus octotaenia and Four-line: Pseudocheilinus tetrataenia ). Fish groups that are usually found foraging immediately above their habitat include some of the butterflyfishes (especially amongst those readily available to hobbyists, the threadfin, Chaetodon auriga, the raccoon, C. lunula and both Longnoses, Forcipiger flavissimus and F. longirostris. ), and the principal Hawkfishes collected from here: the arc-eye and freckleface (Paracirrhites arcatus and Paracirrhites forsteri respectively). Typical for most of the Hawaiian chain, there is minimal invertebrate diversity, with most of the habitat being made up of Porites corals: overwhelmingly the Finger Coral (Porites compressa) with a sprinkling of other Porites species occurring at the fishes lek territory edges. There should not be much in the way of competing micro-algae scraping competitors placed with a Potter's, as they may denude too much of this needed food supply. Other organisms found here can be identified by a cursory reading of my book: Fishwatcher's Guide to the Marine Aquarium Fishes of the World, vol. 1, a search by country/island group on Fishbase.org, or a review of the references listed at the end of this article. 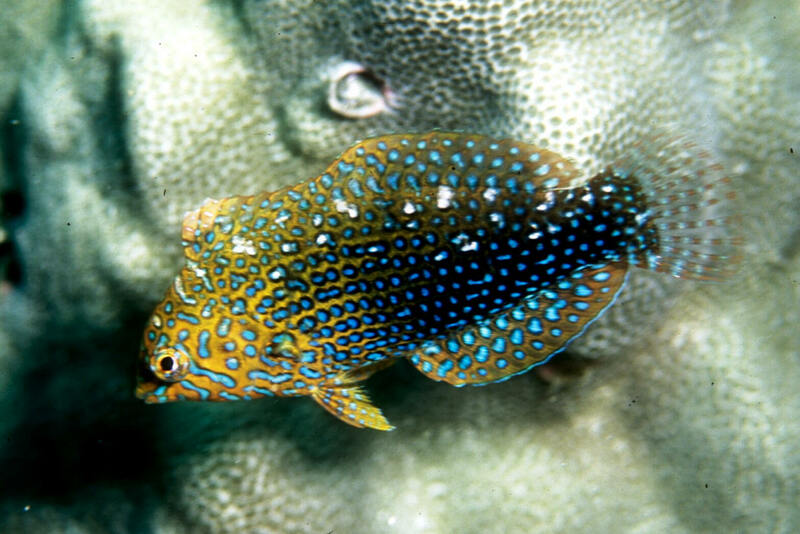 Macropharyngodon geoffroy (Quoy & Gaimard 1824), Potter's Leopard Wrasse. Found in Hawai'i to Micronesia and the East Indies. 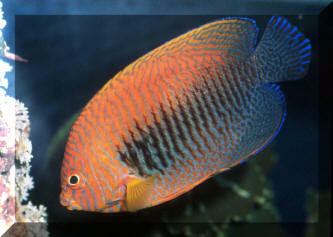 A Batesian mimic, look-alike for Potter's Dwarf Angelfish, Centropyge potteri. Like its namesake, this tends to be a very delicate aquarium species. Kona and aquarium photos. In the wild and captivity Potter's angel feeds on algae and detritus. Though it may appear to take prepared foods, these alone will not sustain this species. Having some attached algae in its environment, and not-too-clean circumstances will provide sufficient forage for this species. Nonetheless, you are encouraged to offer ancillary foods, such as small zooplanktonic organisms, and bits of sheet algae (on a clip placed near the bottom). Potter's angels, like all pomacanthids are egg-layers (oviparous). Strange to me is the Fishbase.org statement that unlike many haremic Centropyge species, this one is monogamous, remaining with one mate for life (Males are a bit larger, with more colorful pectoral and pelvic fins). I could swear I've observed them in the wild, one male to a few attentive females. Like their congeners, this species is a synchronous protogynic hermaphrodite; a dominant female in a group becoming a male. In the wild peak reproductive behavior occurs from mid-December through May. The species spawns at dusk during the week before full moon. Eggs and sperm are released into the water, the young are planktonic... attempts at captive breeding/rearing have failed thus far. Unfortunately, the Potter's is very prone to loss w/o much notice. Most die "mysteriously" during the night... "Looking perfectly fine" the day before. Following up on the issue of PTSD, the species is simply given to a low tolerance to "stress"... Like all Centropyge, the Potter's is susceptible to pathogenic reef diseases like Crypt and Amyloodinium, and if your system should show signs of these agents, this dwarf angel will likely be amongst the first to perish. Historically the Potter's angel has a lousy survival record in captivity. Likely less than five percent are alive within one month of capture... Most of this attrition can be traced to damage in collection (getting thrashed by nets, their gill/opercular spine getting caught in netting), holding (totally unnatural "cubicle" settings or mixed in with fishes w/ no cover to hide in), shipping in too small bags... Along with dealers' and hobbyists' practiced ignorance in keeping the species in inappropriate settings. This species needs room (at least a hundred gallons), with lots of spaces, crevices to dart through and out of the way, and a paucity of too-active fishes kept with it. The best situation, as you might also assume, would be a biotopic Hawaiian reef slope set-up with species to be found there. Given plenty of healthy live rock and a calm, stable setting of size, and of course the selection of an initially healthy specimen, the Potter's is not a difficult animal to keep. Allen, Gerald R. 1985 (3d ed.). Butterfly and Angelfishes of the World, v. 2. Aquarium Systems, OH. 352 pp. Allen, Gerald, Roger Steene & Mark Allen. 1998. A Guide to Angelfishes & Butterflyfishes. Tropical Reef Research/Odyssey Publishing, Singapore/San Diego. 250pp. Burgess, Warren E., Herbert R. Axelrod & Raymond E. Hunziker. 1990. Atlas of Aquarium Fishes Reference Book, v.2, Marine Fishes. T.F.H. Publications, Inc. NJ. 768pp. Campbell, Douglas G. 1983. Marines: their care and keeping; Centropyge: pts. 1,2. FAMA 3,4/83. Debelius, Helmut & Hans A. Baensch. 1994. Marine Atlas, v.1. MERGUS, Germany. 1215pp. Emmens, C.W. 1985. Smaller Pacific angelfishes. TFH 6/85. Fenner, Robert. 1998. Perfect little angels (Centropyge). TFH 4/98. Hoover, John P. 1993. Hawai'i's Fishes; A Guide For Snorkelers, Divers, and Aquarists. Mutual Publishing, Honolulu. Kuhling, D. Undated. Centropyge, dwarf angelfish who must eat their greens! Aquarium Digest International #38. Kuiter, Rudie H. & Helmut Debelius. 1994. Southeast Asia Tropical Fish Guide. Tetra-Press, VA. 321pp. Michael, Scott W. Fishes for the marine aquarium; pts. 16 &17: Pygmy angelfishes- diminutive, but beautiful; Some possible pygmy angels for your marine tank. AFM 1,2/96. Moenich, David R. 1987. Angel food; the most important single factor in keeping marine angels healthy is a varied diet. TFH 6/87. Moenich, David R. 1988. Pygmy angelfishes: the genus Centropyge. TFH 1/88. Nelson, Joseph S. 1994. Fishes of the World. John Wiley & Sons, NY. 600pp. Randall, John E. 1996. Shore Fishes of Hawai'i. Natural World Press, OR. 216 pp. Steene, Roger C. 1985 (2d. ed.). Butterfly and Angelfishes of the World, v.1. (Australia). Aquarium Systems, OH. 144pp. Stratton, Richard F. 1994. Practical angels. TFH 9/94. Taylor, Edward C. 1983. Marine angelfishes- thinking small. TFH 5/83. Thresher, R.E. 1984. Reproduction in reef fishes, pt. 3; Angelfishes (Pomacanthidae). TFH 12/84. Wrobel, David. 1988. Dwarf angels of the genus Centropyge. SeaScope Spr. 88.